Families Belong Together protests against the Trump administration's zero tolerance immigration policy took place across the nation on Saturday. Thousands of people showed up at more than 700 rallies. Dozens of groups were responsible for planning the protests, including Move On, ACLU, and the Leadership Conference on Civil Rights. Protesters in DC marched to the White House, shouting "Shame" and waving signs. Organizers estimated that 30,000 people took part in the protest in the nation's capital alone. Donald Trump was not at the White House, as he had decided to spend time at his golf course in New Jersey. About 200 protesters picketed near that location. 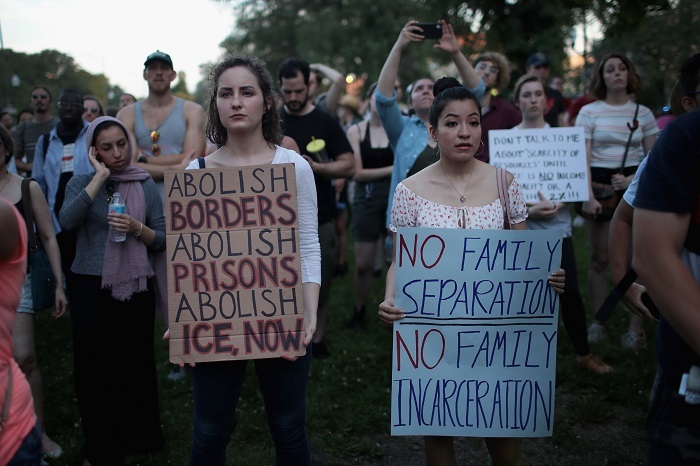 An estimated 50,000 people took to the streets to protest in Chicago yesterday, denouncing the zero tolerance policy and calling for reunification of separated families. In Boston, thousands rallied together where they heard Senator Elizabeth Warren speak. Over 15,000 gathered in New York City, marching together across the Brooklyn Bridge. Celebrities took to the streets and to stages across the country as well. In Los Angeles, John Legend urged the tens of thousands gathered to resist the "temptation to just disengage" and debuted his new song "Preach." Lin-Manuel Miranda, the creator of the musical hit "Hamilton," sang a lullaby to the crowd in DC, in honor of all of the parents unable to sing lullabies to their separated children. Alicia Keys and America Ferrera, also in DC, read letters from families who were separated from their children. More modest protests were seen across the country, with protests being held in all 50 states. The heat on Saturday was extreme, with some locations facing triple digit temperatures. Nevertheless, people were not deterred. Last week, US District Judge Dana Sabraw ordered that the federal government reunited detained migrants and their children within 30 days. Currently, the Trump administration is now planning to detain families together indefinitely.